No. 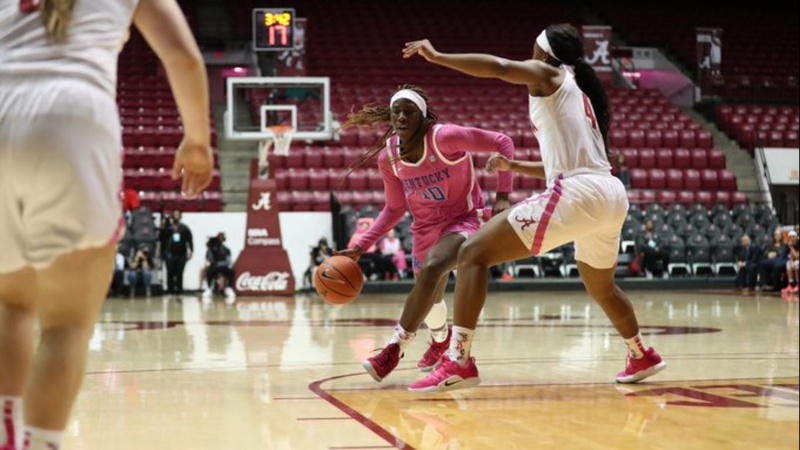 17 Kentucky went down to Tuscaloosa and defeated Alabama, 68-53 on Monday night thanks to the help of Rhyne Howard’s 23 points and Maci Morris’s 17. Kentucky also got 10 points from Tatyana Wyatt and six from both Blair Green and Taylor Murray. Turnovers were the key factor in the game. Kentucky forced 24 Alabama turnovers and scored 20 points off those miscues. Kentucky only turned the ball over 8 times and Alabama was only able to score 5 points off of them. Both Kentucky Alabama and Kentucky struggled to get the game started with Kentucky missing its first five shots from the floor and trailing Alabama 4-0. Murray gave UK their first lead of the game, 6-4, on a steal and a lay-up. Alabama would tie it up 6-6 before Kentucky would score five in a row. Alabama would battle back to tie it again, but a bucket by Morris closed the quarter giving UK the lead 15-13. Kentucky started the second quarter out hot scoring the first seven points, including five of them by Howard to build up a 22-13 lead. Kentucky would lead by as many as 11 before Bama would score 8 in a row to cut the lead to 3. Kentucky scored four in a row before Alabama closed the gap to 33-29 at the break. Alabama would start of the 3rd quarter by cutting the lead to two with the first two points, but Kentucky would answer on a run that proved to be the pivotal point of this game. The Cats scored 13 straight points and turned a 2 point advantage into a 15 point lead. Morris had nine points during the run. Alabama would briefly stop the run, but Kentucky would hold a 52-35 lead at the end of the third. Alabama would try to chip away at the Kentucky lead, but when they would Kentucky had an answer and won 68-53. Kentucky’s lead fluctuated between 11 and 17 points the entire quarter. On Sunday, Kentucky takes on Arkansas at Memorial Coliseum at 2 p.m. ET. The game can be seen on SEC Network+.